People, one of them with a Catalan independence flag around her shoulders, watch Spain's King Felipe's statement about the situation in Catalonia. SPAIN’S KING FELIPE VI has this evening sternly denounced the bid by Catalan leaders to make their region independent and threw his weight behind the national authorities’ efforts to “ensure constitutional order”. Felipe had previously struck a conciliatory tone over the tensions with Catalonia but raised the tone dramatically in a short televised address, warning that Catalan leaders’ “irresponsible conduct could put at risk the economic and social stability of Catalonia and all of Spain”. The king broke with his previously measured tone, warning that “it is the responsibility of the legitimate state powers to ensure constitutional order”. His address comes hours after over 700,000 people took to Barcelona’s streets to protest against police violence during a banned weekend independence referendum in Catalonia, demanding to be heard. Crowds in Barcelona yelled for national security forces to get out, branding them “occupation forces” and raising their middle fingers at a police helicopter circling overhead. Barcelona football club refused to train as part of a strike. Officials said the strike slowed down public transport and paralysed freight shipments in the port of Barcelona. It also closed down tourist sites such as the city’s emblematic Sagrada Familia Church. Protesters rallied in the afternoon and a further demo started in the early evening, with demonstrators dancing in a central Barcelona avenue and beating drums in a carnival atmosphere. “The streets will always be ours,” young protesters yelled. Pictures of police beating unarmed Catalan voters with batons and dragging some by the hair during Sunday’s ballots drew international criticism. Some demonstrators said they were not pro-independence but came out to protest in anger at the police violence. “The important thing is for the people to be united,” said one such voter, Rachael Moya, a social worker. Catalan regional leader Carles Puigdemont said nearly 900 people had received medical attention on Sunday, though local authorities confirmed a total of 92 injured. Four were hospitalised, two in serious condition. The national government said more than 400 police officers were hurt. Email “Spain's King Felipe VI declares Catalan vote illegal and warns against unrest”. 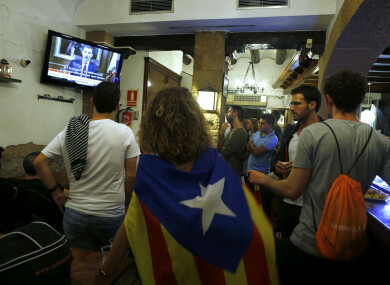 Feedback on “Spain's King Felipe VI declares Catalan vote illegal and warns against unrest”.